Hi everyone. We decided to put up our usual weekly thrifting post a bit early, since we've got a full weekend ahead of non-shop related things to work on (taxes being the number one thing). Thursday is usually not a day we venture out to the thrifts, but I decided to change it up and came away with a few goodies for my trouble. 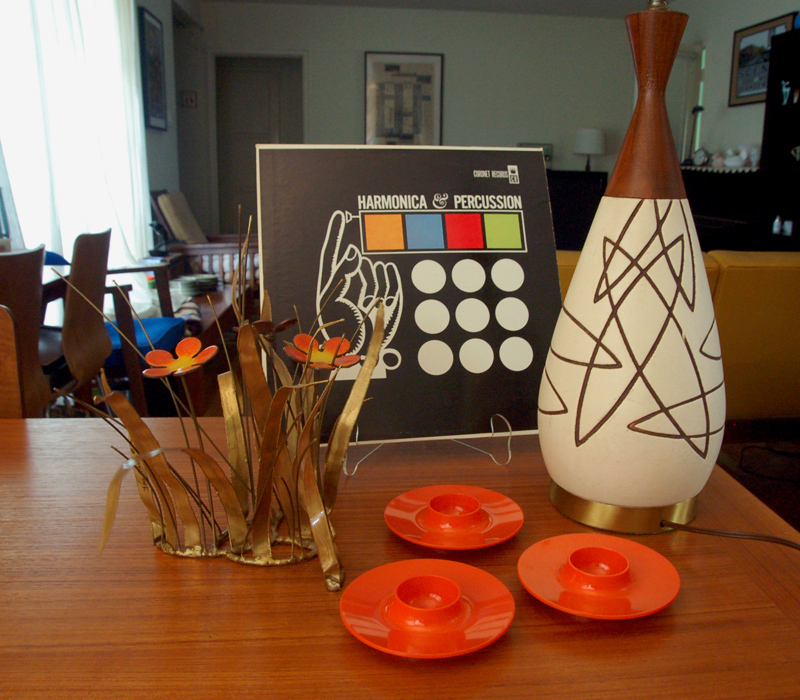 One of the coolest finds was the interesting midcentury style wood and ceramic lamp. So far, have not been able to identify it - there aren't any markings we can see. The shade that came with it was obviously added later, so we didn't even want it in the picture. We don't think it's any famous designer, and it probably isn't the nicest workmanship. But we rarely see lamps like these at affordable prices around here. Anyone have ideas who might have produced it? The three orange plastic egg cups in the front are made by Rosti in Denmark. Rosti's hard plastic mepal items are a fun pick-up at thrifts, and they're actually extremely affordable if you want to try and make a set. The album cover in the back is designed by Sam Suliman. He did a lot of older LP covers and books. We still aren't sure whether or not we're going to start selling LPs on the site. We come across interesting modern record covers fairly frequently - but we're just not sure if we want to get into that game. For now, we'll pick them up if they're reasonable. It's also fun to look for, because most of the "serious" record pickers don't focus as much on illustration. Lastly, my heart leapt when I spotted this metal enamel flower sculpture sitting on the shelf. Curtis Jere, right? Nope, not in this case. It's actually signed with a different name, Ken Rains, and is probably a more recent production. I wasn't able to find out too much information about Rains, other than the fact that he did produce metal items similar to C Jere. Actually, the quality is quite nice. We'll probably put it up in the shop next week or so. OK, hope you enjoyed this thrift roundup. We may not get another one for awhile, since we're going to try and concentrate more on listing items in the main shop and Etsy outlet, as opposed to acquiring more inventory.